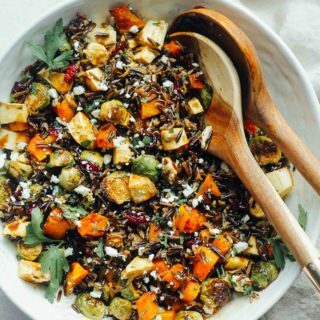 Say hello to my go-to holiday appetizer! 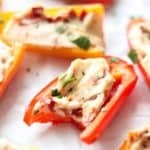 These Sun-dried Tomato and Whipped Feta Stuffed Mini Peppers are a crowd-pleaser and so easy to make. Nothing says holiday gatherings like grazing over a huge spread of appetizers before sitting down to a ham or turkey feast. Am I right? I’m all too familiar with the regret of filling up on appetizers and then feeling too stuffed to eat dinner! So today, I’m sharing a lighter, low carb appetizer you can bring to your next holiday party. 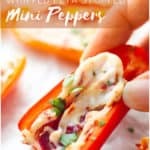 With just a few ingredients and 3 steps, these Sun-Dried Tomato Whipped Feta Stuffed Mini Peppers come together in minutes, and they can be served hot or cold. The whipped feta filling is simply amazing and so easy to make. Combine softened cream cheese and feta in a food processor and blend until smooth. 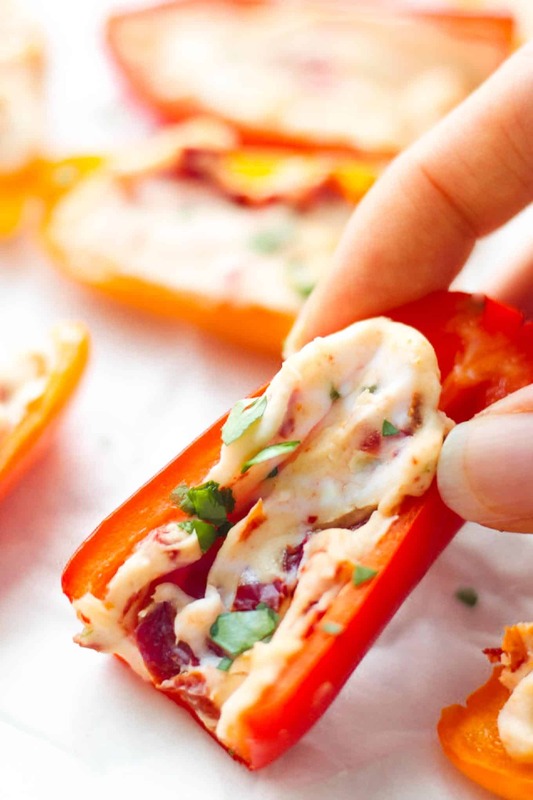 Then, add in some sweet, sun-dried tomatoes, a sprinkling of chopped green onion and garlic, and you’ve got yourself one heck of a filling for these mini peppers. 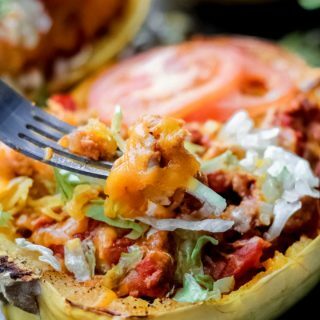 Make a double batch and use the extra as a spread on crackers, bagels, sandwiches, and wraps (it would be amazing on these wraps)! 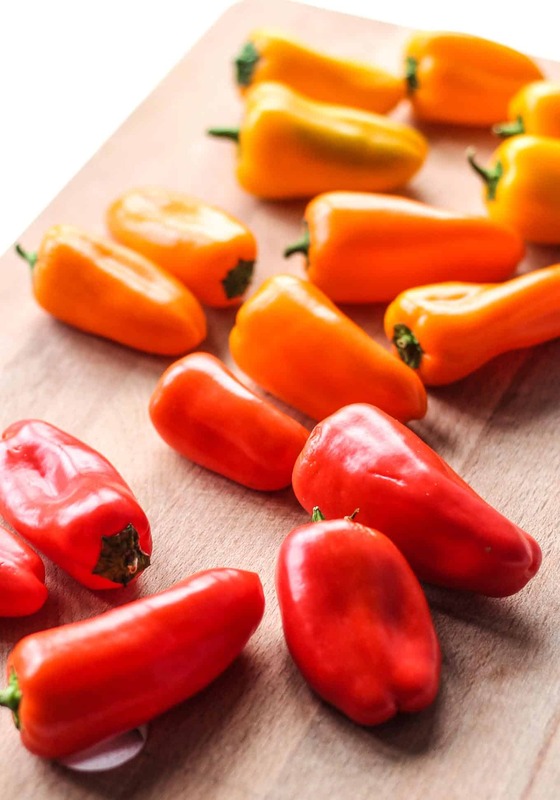 Plus, a major bonus to preparing these appetizers is that, unlike jalapeños, these mini peppers don’t pack any spicy heat. Which means, the de-seeding process only takes a couple minutes and you don’t have to worry about that burning sensation if you accidentally touch your face. I literally just sliced the peppers in half and tore out the seeds and extra ribs with my fingers. Filling the peppers is a super quick process too. Don’t worry about portioning out the right amount for each pepper or filling the pepper to the max. A little bit goes a long way when feta is involved! Simply grab a butter knife and casually smear a bit in each half. 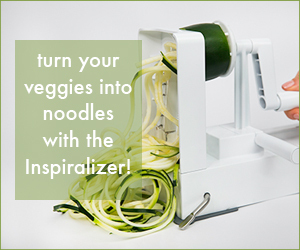 Once filled, eat them as is, especially if you love the crunch of raw veggies. Or, as the recipe states, you can heat them in the oven to soften and slightly caramelize the peppers and warm the whipped feta. 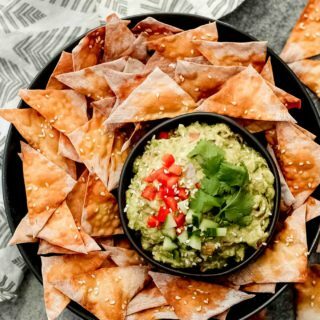 Either way, this is a delightful and festive appetizer that won’t weigh you down! 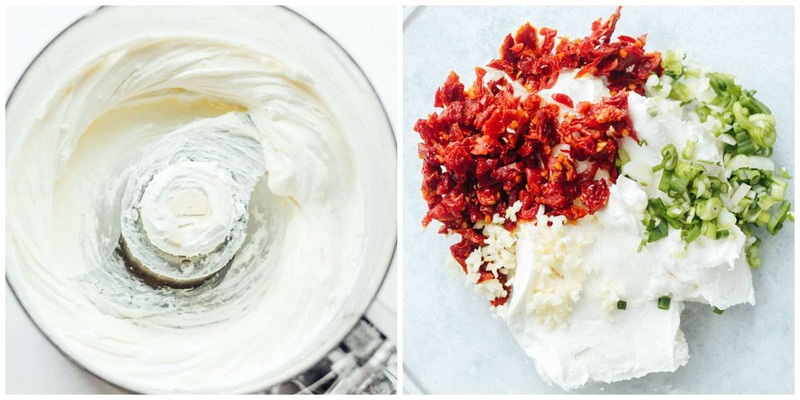 Place the cream cheese and feta cheese in a food processor. Process the mixture until smooth and creamy. Transfer the whipped feta to a bowl. Add in the chopped sun-dried tomatoes, green onion, and garlic and stir to incorporate. 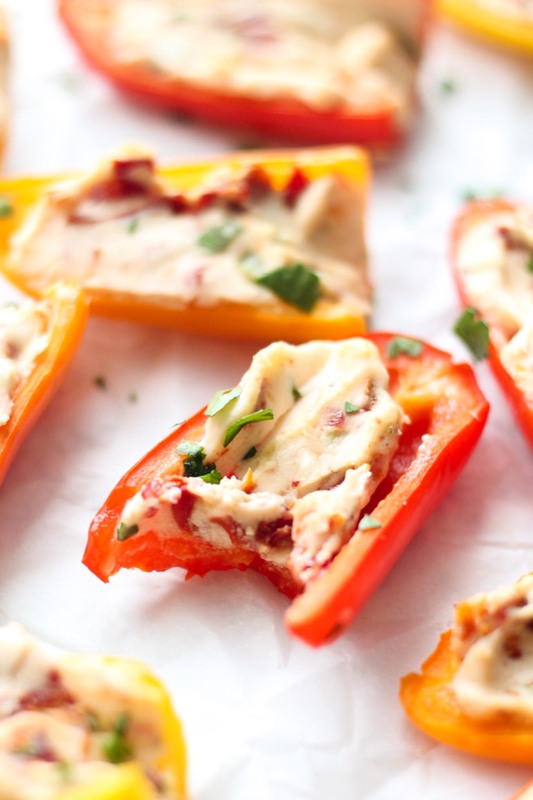 Spread the whipped feta onto each pepper half. 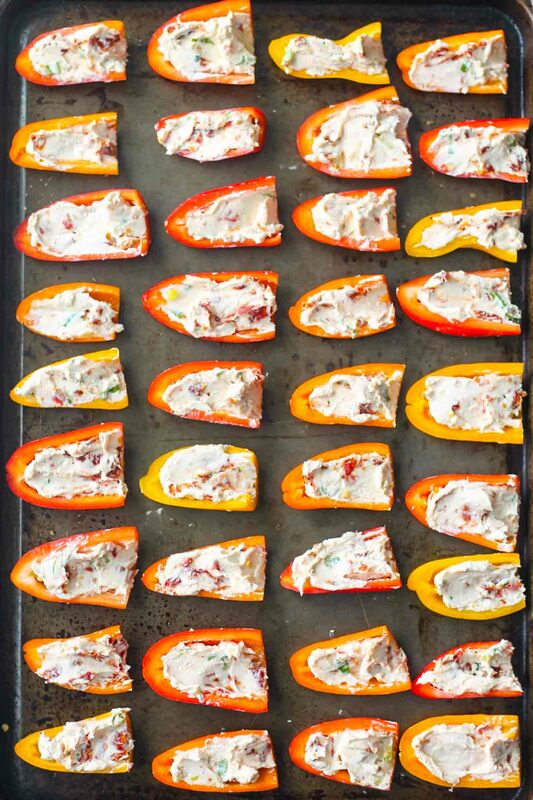 Place the stuffed peppers on a lined baking sheet. Bake in the oven for 8-10 minutes. Sprinkle with fresh herbs if desired. 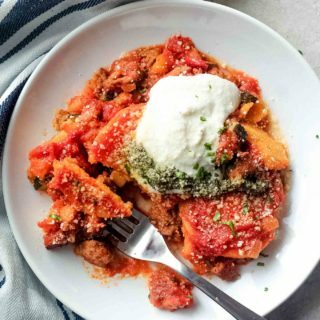 Sign up to receive new recipes via email! 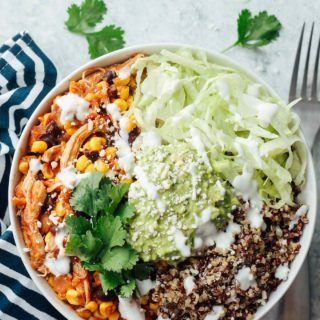 Do you sprinkle parsley on top? 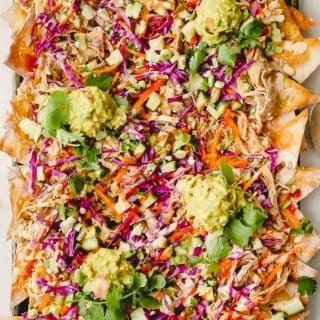 Did not see this in your instructions or as an ingredient in the recipe, but in the picture there is something something green. Thanks for the comment! A sprinkle of fresh herbs on top is totally optional. I think I used parsley, but basil would be a good choice too!